Make way for Captain Mickey Mouse! Fantastic stone resin statue stands 8 1/8-inches tall. Designed by pop artist Romero Britto. Argh, matey, Cap'n. Mickey Mouse be on deck! 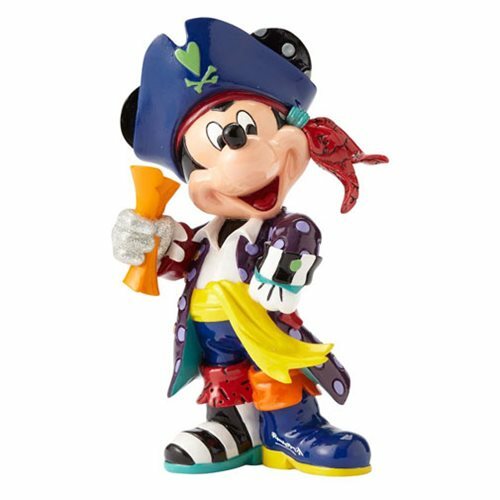 Designed by pop artist Romero Britto, and hand-crafted and hand painted by skilled artisans, this fantastic Disney Mickey Mouse Pirate Statue by Romero Britto presents Captain Mickey as a pirate dream, holding the coveted treasure map. Made of stone resin, it measures about 8 1/8-inches tall, ready to sail over to your port. Ages 15 and up.